The Kisan CG-25 Chargeguard is a digital multi-meter with 4 modes of display: voltmeter, ammeter, ambient temperature and a flashing ice alert warning. The CG-10 package adds a tiny on-board battery charger. The specifics on the Chargeguard system are on Kisan's website. At about $150, it's a relatively expensive but all-in-one monitoring solution. The Kisan powers up when either the multi-function button is depressed or it detects voltage, and turns itself off after a few minutes' absence of voltage, which negates the need to splice into a switched circuit or to run a relay. Another nice feature is an auto-dimming backlight. Installation is fairly straightforward, but before delving into the project I highly recommend searching the 'Net for examples of mounting options for the display unit and options for mounting the battery shunt. I decided to mount my display unit on my handlebars, between the bar mounts. I couldn't get the unit as secure as I wanted on my 7/8" bars (it's held on by zip ties), so I took a couple of inches of an old gel handgrip, slit it and slipped it over the bars and under the Kisan mounting tabs. After cranking down on the zip ties, the unit was rock solid. I zip-tied the temperature probe to a fairing stay under my dashboard, where it would be shaded in order to obtain a more accurate temp signal. The Chargeguard performed spectacularly...for a couple of thousand miles, after which it sporadically began refusing to power up on "igntion on" (it would work if the button was pressed). I would also occasionally find that it had turned itself on hours after it had shut down. These were minor issues I could've lived with; however, somewhere between 7 - 8,000 miles the characters in the display went bonkers (flashing, segments inop, flashing rapidly, etc.). I took the unit apart hoping (?) to find water intrusion or something obviously wrong in the circuit board, but all appeared visually well. Having exhausted my very limited electrical "expertise", the unit and associated wiring was removed and 'canned. In light of my short-lived and expensive experience, I can't recommend Kisan Chargeguard. I've recently replaced it with a simple Datel 2-wire voltmeter, and I've got a Teltek electronic thermometer on order. I won't have an ammeter or some of the niceties of the Kisan unit, but I'm hoping they'll function much longer. I'll report on the Datel and Teltek units down the road a bit. 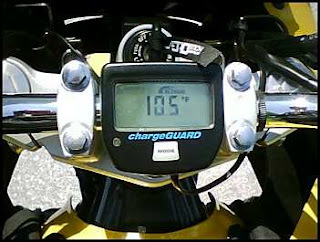 Before its demise, the unit faithfully displayed the temp, including this rather warm commute home one day last summer.